This specialist is not available until 28 Apr 2019. "This report was great and so much more detail. Really helpful. 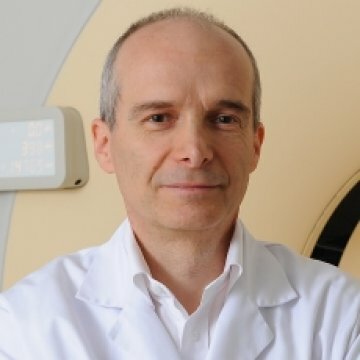 Thankyou Pierre"
I have over 25 years of experience in most fields of imaging and techniques, including MRI, CT, Ultrasound, Mammography, and Bone densitometry. I have special interest for musculoskeletal radiology, but I am also very well trained in breast imaging, abdomen and thorax imaging. At present, I am in charge of a private radiology institute near Lausanne, Switzerland. Radiology portal (swissradiology.com), containing patient and medical information, swiss physicians directory, forum and mailing list (Medromands, more than 2'500 doctors), guidelines for radiology, medical tips, etc. Kaiser L, Lew D, Hirschel B, Auckenthaler R, Morabia A, Benedict P, Terrier F, Stalder H. Radiological maxillary sinusitis in patients with common cold. J Fam Pract. 1998 Jul;47(1):72-4. Kaiser L, Lew D, Hirschel B, Auckenthaler R, Morabia A, Heald A, Benedict P, Terrier F, Wunderli W, Matter L, Germann D, Voegeli J, Stalder H. Effects of antibiotic treatment in the subset of common-cold patients who have bacteria in nasopharyngeal secretions. Lancet. 1996 Jun 1;347(9014):1507-10. Oral presentation, 81th congress of Swiss Radiology Society on june 3rd 1994, about "Maxillary sinus and rhinitis"
Poster at 79th congress of SSRM (Flims, 1992): "Rôle de l'IRM dans le diagnostic des tumeurs de la lame quadrigéminale"